Chinaman’s Hat in Windward Oahu, one of the attractions on Oahu. 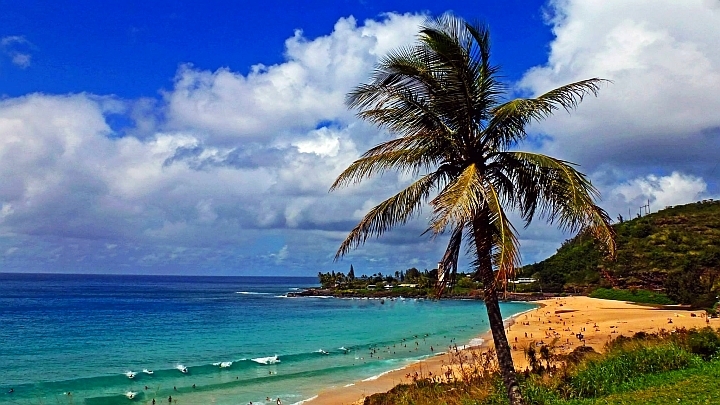 The island of Oahu in the State of Hawaii draws millions of vacationers from far and wide. They come because of the island’s diverse cultures, verdant landscapes and thriving capital city, Honolulu. Some of the attractions on Oahu can be found right off the main highways. Planning to spend a full day on a road trip on Oahu? If so, we recommend driving east from Honolulu to the North Shore. Then head and along Kalaniana’ole Highway and north on Kamehameha Highway. Along this way, there are some of the best attractions on Oahu you will not want to miss. Driving along Kalaniana’ole Highway offers a number of great roadside stops. You can stop by Haunama Bay, a highly popular beach and marine sanctuary. Here, you can view a wide range of undisturbed ocean life. Plus, the swimming and snorkeling here are suitable for people of all ages and skill levels. Nearby is the Halona Blowhole where you can see sea water gushing out of an ancient lava tube like a geyser. Past the blowhole is Sandy Beach, one of the best places on the island for bodysurfing. But don’t try bodysurfing here if you are a novice as it can be extremely dangerous. If you are less of a swimmer and more of a hiker, go for an early morning hike at the Makapu’u Point Lighthouse. This is where you’ll find breathtaking views of neighboring Rabbit Island and Black Rock islet. On a clear day, you might catch a glimpse of Molokai and sometimes whales during their migratory season. Heading along the Kalaniana’ole Highway immediately past Makapu’u Point is town of Waimanalo. This is where you’ll find the popular marine wildlife park, Sea Life Park. At this place you’ll see seals, ocean birds, dolphins and native Hawaii reef fish on display. Waimanalo also has a highly rated beach at Bellows Field Beach Park. Plus, there are some great places along the way to get a fresh smoothie or some delicious fish tacos. The Byodo-in Temple in Kaneohe. 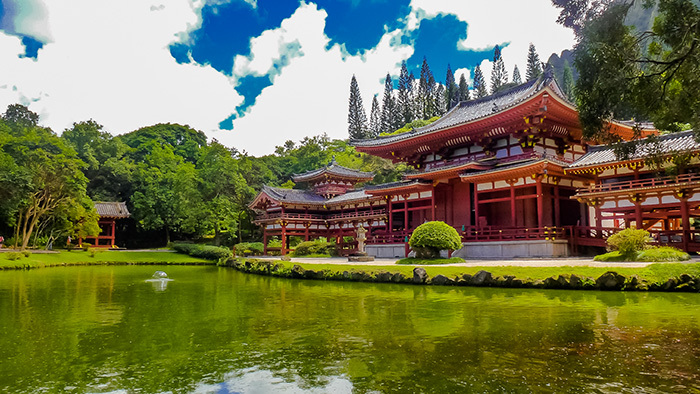 In the town of Kaneohe are the Ho’omaluhia Botanical Gardens and Byodo-In Temple. The Ho’omaluhia Botanical Gardens showcase a wide range of tropical plants from throughout the world. The Byodo-In Temple is a scaled down re-creation of a world famous temple in Japan. It’s one of the more interesting roadside attractions on Oahu. Also the temple is where a number of television series in Hawaii like Hawaii Five-O and Lost. Past the town of Kaneohe on Kamehameha Highway is Kualoa Regional Park and Kualoa Ranch. Kualoa Regional Park is a great place to lie on the beach, soak in the sun and go for a swim. Across the beach is one of Windward Oahu’s most prominent landmarks, the islet of Mokoliʻi. 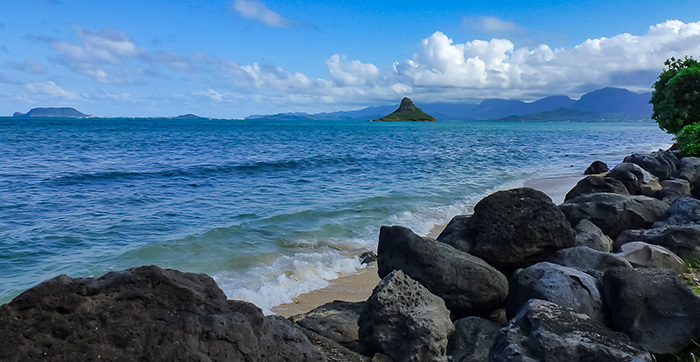 It is popularly known as Chinaman’s Hat because its shape resembles one. Across Kualoa Regional Park is Kualoa Ranch, a private ranch and nature preserve. It also offers horseback riding and ATV excursions. And it features movie location spots like Jurassic World, Godzilla, You Me & Dupree, 50 First Dates and many more. This would not so much of a roadside stop and more of an experience that could take all day. But we would be remiss in not mentioning the world renowned Polynesian Cultural Center in Laie. 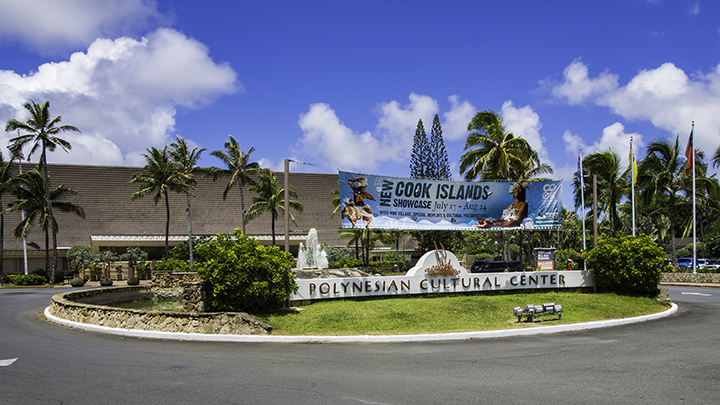 The center showcases the rich cultures, foods and heritage of Polynesia. This includes places like Hawaii, Samoa, Aotearoa (New Zealand), Fiji, Tahiti and Tonga. Nothing says casual roadside stop in Hawaii like visiting an old sugar plantation town, as would be in the case in historic Kahuku. The sugar plantation days are long gone and the town is now better known for its locally grown shrimp. So it’s no surprise that there is a long line of food trucks serving this great tasting and locally sourced crustacean. Because they are so fresh, you won’t have to substitute quality for convenience in food truck establishments like Fumi’s Kahuku Shrimp, Giovanni’s Aloha Shrimp, Romy’s Kahuku Prawns and Shrimp and more. All serve up scrumptious portions of buttery, garlic-infused shrimp caught fresh daily. Here you’ll be licking your lips and asking for more. Waimea Bay on the North Shore of Oahu. The North Shore includes famous surf spots such as Sunset Beach, the Banzai Pipeline and Chun’s Reef. Perhaps more importantly, this is where you can see huge waves during the winter season. But on other days when the surf is not up, you can also see a honu or green sea turtle snoozing on the beach. If you really want a good glimpse of these creatures, stop off at Laniakea Beach. It’s also called “turtle beach” by many because of its abundance of honu. Be respectful of these creatures and keep a fair distance as it is illegal to touch or come close to these turtles. If you still have time, you can visit Waimea Valley, located directly across beautiful Waimea Bay. It is a botanical garden and Hawaiian heritage park that features a beautiful waterfall. Before you hit the road again, stop in for a treat at Ted’s Bakery near Sunset Beach. Also, make sure you don’t leave the North Shore without visiting Matsumoto’s shave ice store.